Judge Brett Kavanaugh arrives to testify during the second day of his Supreme Court confirmation hearings on Wednesday. Wearing a "Women For Kavanaugh" T-shirt, Annabelle Rutledge watches with others as Kavanaugh testifies on Wednesday. John Dean, former White House counsel to President Nixon, told the Senate panel if Kavanaugh is confirmed, the Supreme Court would become "the most presidential powers-friendly court in the modern era." Democratic Sens. 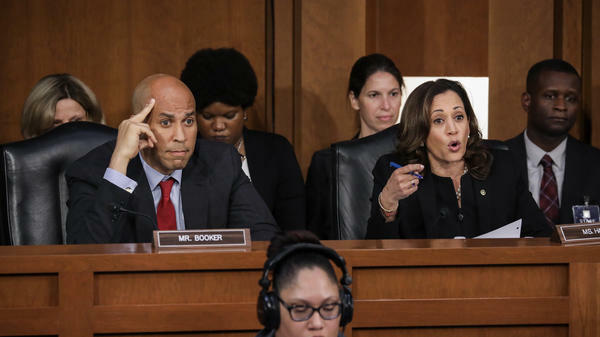 Cory Booker of New Jersey and Kamala Harris of California both scored points with the progressive base during the Kavanaugh hearings. 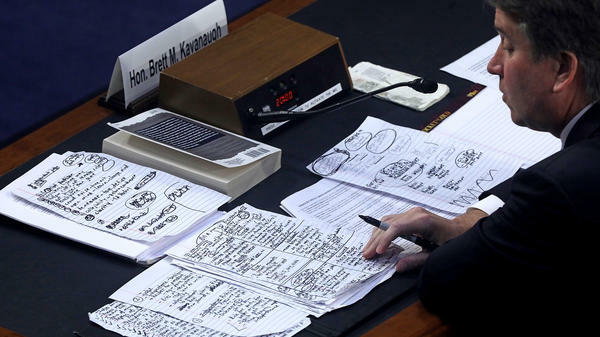 Kavanaugh looks over his notes while testifying on Thursday. If you got the sense from watching Kavanaugh this week that he was a friend to, and valued women, that's certainly the impression he was shooting for. The girls Catholic Youth Organization basketball team he coaches visited the hearing room Thursday for a photo-op. He mentioned the strong women in his life, starting with his mother, who he credited for showing him "the importance of women's equality." And he spoke of the number of women he's hired as law clerks while on the D.C. Circuit Court of Appeals — 25, of whom 21 have gone on to become clerks on the Supreme Court, Kavanaugh said — and he promised that, if confirmed, he'd continue his practice of hiring promising female lawyers to be his clerks. 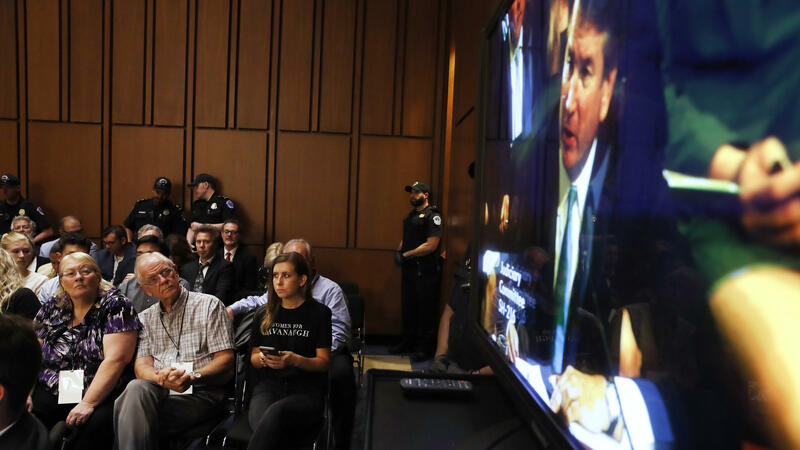 So it's not surprising that at least one spectator in the hearing room wore a T-shirt that proclaimed "Women for Kavanaugh." The hearings began Tuesday with striking images of women protesters on Capitol Hill dressed as characters from television's The Handmaid's Tale. 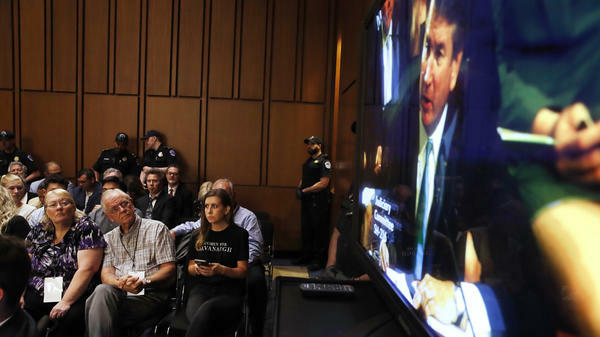 On Wednesday, at least one such demonstrator was dragged out of the hearing room, yelling "Stop Kavanaugh. Our bodies, our choice." And many other protesters throughout the hearings were women. Many women are deeply concerned about Kavanaugh's views on reproductive rights, an issue of extreme importance to them. And Kavanaugh's testimony that Roe v. Wade, the 1973 Supreme Court decision that legalized abortion, "was settled as a precedent of the Supreme Court," and that it had been reaffirmed by a subsequent high court decision, Planned Parenthood v. Casey — which he said was "precedent on precedent" — didn't do much to allay those concerns. An email Kavanaugh authored in 2003 and reported on by the New York Times this week seemed to undermine Kavanaugh's stated view that Roe is settled law. Kavanaugh wrote that "I am not sure that all legal scholars refer to Roe as the settled law of the land at the Supreme Court level since Court can always overrule its precedent," which is precisely what pro-abortion rights advocates fear most — and that Kavanaugh would be part of a conservative majority on the Supreme Court to do just that. Kavanaugh explained this week that in the email he was simply editing a proposed op-ed article and that the descriptive "all legal scholars" was overly broad. Abortion rights advocates also sounded alarm bells Thursday, when Kavanaugh referred to some forms of birth control "as abortion-inducing drugs." A tweet from NARAL called Kavanaugh's comment "not only an anti-science lie, it's an anti-choice extremest phrase." During testimony Friday, NYU Law School professor Melissa Murray, a former law clerk to Justice Sonia Sotomayor, said Kavanaugh will provide the "necessary fifth vote that would utterly eviscerate" Roe v. Wade. Kavanaugh's did little to illuminate what critics say are his expansive views of executive power. He dodged questions about whether a president could pardon himself, or could be subject to a subpoena, although he did call the Supreme Court's 1974 decision that forced President Nixon to turn over the Watergate tapes "one of the greatest moments in American judicial history." 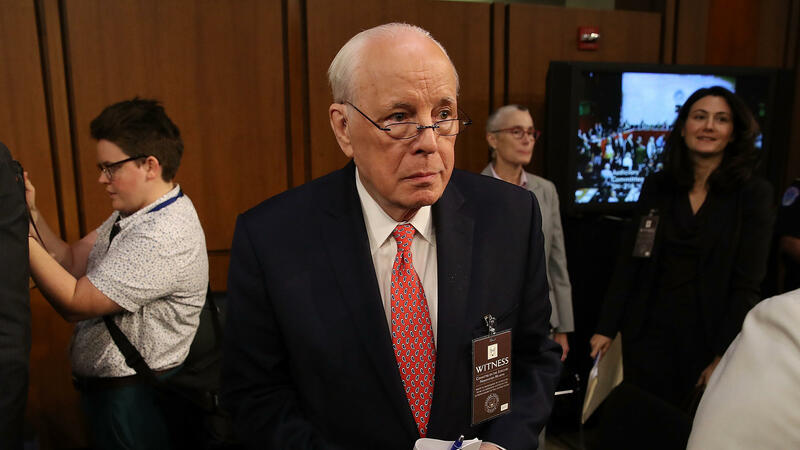 Coincidentally, Nixon's White House counsel John Dean testified Friday. He told the committee if Kavanaugh is confirmed, the Supreme court would become "the most presidential powers-friendly court in the modern era." He added that "under Judge Kavanaugh's recommendation, if a president shot someone in cold blood on Fifth Avenue, that president could not be prosecuted while in office." 3. "A skeptic of unauthorized regulation, of illegal regulation"
"I've heard it said that I'm a skeptic of regulation," he said. "I'm not a skeptic of regulation at all. I'm a skeptic of unauthorized regulation, of illegal regulation, of regulation that is outside the bounds of what the laws passed by Congress have said." Let's unpack that statement: Regulation "outside the bounds of what the laws passed by Congress have said" is contrary to a basic tenet of Republican and conservative principles about small government and limited governmental. But, it's also a basic tenet of a Supreme Court doctrine in administrative law known as Chevron deference. The Supreme court ruled in Chevron v. NRDC in 1984 that when a statute is ambiguous, courts should defer to reasonable interpretations of the statute by the federal agencies that apply the law. Chevron deference has been used to defend environmental, worker and consumer regulations. Not surprisingly, corporations tend not to be fans of it — arguing that it's led to regulatory overreach — and would like to see the Supreme Court narrow the scope of, or even do away with, the deference principle announced in the Chevron case. For Democratic Sens. Kamala Harris, of California, and Cory Booker, of New Jersey, the week was a chance to grab some national attention and score some points with the progressive base — as many political observers wonder about their presidential aspirations in 2020. Harris showed off her prosecutorial skills, cross-examining Kavanaugh on issues ranging from whether he had discussed special counsel Robert Mueller's investigation with anyone at a law firm founded by one of President Trump's personal attorneys to questioning the federal appeals court judge about reproductive rights. "Can you think of any laws that give the government the power to make decisions about the male body?," she asked. Kavanaugh struggled to find a response. "I'm not — I'm not thinking of any right now, Senator," he said. At the end of the week, it's almost certain that none of the drama changed any minds. 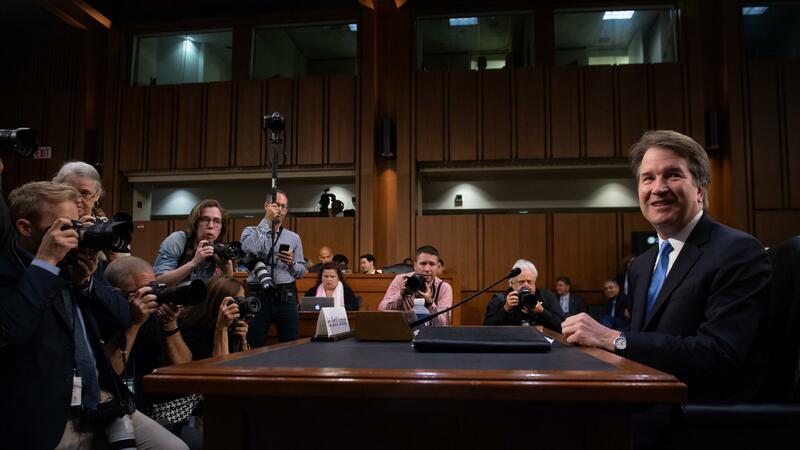 Kavanaugh adroitly avoided any missteps that might have put his confirmation in jeopardy, and Republicans could be nothing but delighted with his largely headline-avoiding performance. In about two weeks, the committee will likely vote along party lines to favorably recommend Kavanaugh's confirmation, and the full Senate is likely to quickly follow suit, possibly in time enough for President Trump's second Supreme Court pick in as many years to take a seat on the high court's exclusive bench by the first Monday of October, when the new Supreme Court term begins.